NASA's Dawn spacecraft obtained this image on its approach to the protoplanet Vesta, the second-most massive object in the main asteroid belt. .
NASA's Dawn spacecraft obtained this image of the giant asteroid Vesta with its framing camera on July 24, 2011 in this stunning space wallpaper. It was taken from a distance of about 3,200 miles (5,200 kilometers). 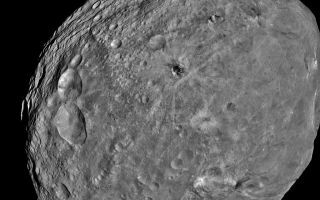 Dawn entered orbit around Vesta on July 15, and will spend a year orbiting the body. After that, the next stop on its itinerary will be an encounter with the dwarf planet Ceres. The Dawn mission to Vesta and Ceres is managed by NASA's Jet Propulsion Laboratory, Pasadena, Calif., for NASA's Science Mission Directorate, Washington, D.C. It is a project of the Discovery Program, managed by NASA's Marshall Space Flight Center, Huntsville, Ala. UCLA is responsible for overall Dawn mission science. Orbital Sciences Corporation of Dulles, Va., designed and built the Dawn spacecraft.